A powerful, flexible content management system designed specifically for local government. Our online wizard guides you through site setup, helping you collect and organize your information up-front. You’ll have a website in about 20 minutes. The setup wizard populates your core pages, creating the navigation and home page automatically. Everything is fully customizable, including the menus. Choose from professionally designed templates that can be customized to fit your brand. The system generates a specialdistrict.org domain name so you can go live quickly, and without the trouble of buying your own domain name, if desired. Or you can use your own. Our flexible, powerful, easy to use content management system makes adding new content, deleting old content and creating new pages easy. Unlimited support means someone is available to help you. We're here for the long haul. And since Streamline is Software as a Service, your technology will never be out of date. We update the platform and you receive all updates, new features and templates as they are created. One low monthly subscription starting as low as $50, no up-front costs, and no long-term commitment eliminates risk and saves you thousands of dollars. It can even save you the trouble of creating cumbersome RFPs. Our web tool creates sites that are secure and Section 508 compliant, so you don't have to worry about your site being available to people with disabilities. The meeting dashboard helps you easily add meetings, agendas and minutes, and even includes a notifier so you never miss an agenda posting deadline. The integrated transparency dashboard helps you understand the requirements of transparency certification, check your progress and easily publish required content. Easily add documentation from within the dashboard to complete requirements and see your status. Streamline includes a dashboard to help you easily set up your regular Board meeting schedule, and see at a glance when your agendas and minutes have been uploaded. Uploading them is quick and easy: simply drag and drop your PDF or other file onto the dashboard to upload. The site also knows when your next meeting is coming up, and will notify you that you’re approaching the deadline to upload your agenda. Streamline has workflow approvals, draft and published states for content collaboration, including content revisions. If something goes wrong you can revert to an old version. You can also upload and manage assets like images, file attachments and videos—all with unlimited hosting! Insert widgets making adding video and other embeddable content easy. Streamline offers unlimited support through our Support Portal, email, and live chat. You can browse our Knowledge Base articles for step-through instructions on how to solve almost any question. If you would rather receive personalized assistance, we're just a mouse-click away! Streamline is software as a service. This means, for your low monthly subscription, your site receives all of the feature releases, theming enhancements and security updates automatically. No need to pay extra for a new theme, updated tools or navigation management enhancements (as pictured). Our entire business is designed to provide affordable website technologies, regardless of your agency size. Streamline Web is available for all local government agencies in the United States for a low monthly subscription fee. No contracts, no RFPs, no up front costs or long term commitment, and no hidden expenses. 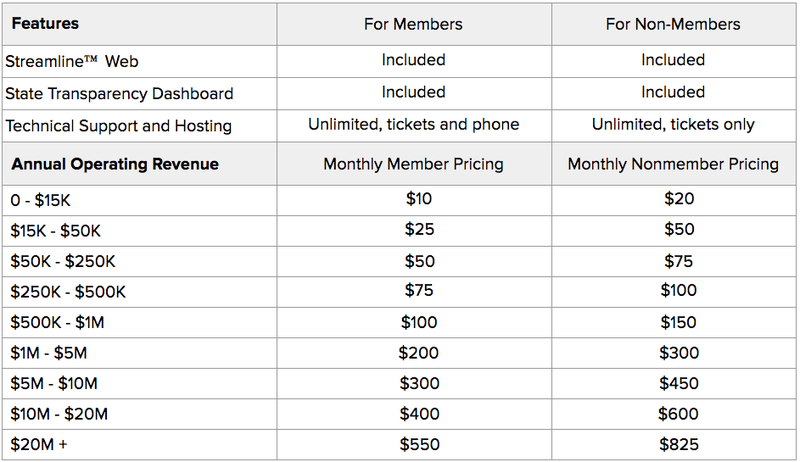 The pricing below includes support and unlimited hosting. The whole point is to make the experience predictable and give you complete control over your content. Members of our partner agencies receive a discount; if you're a member of one of these agencies, please indicate so when you sign-up. If you want an agency you're affiliated with to become a partner of ours, please contact us. Again: no hidden fees. The pricing includes free site setup and training, unlimited hosting and support, full control over website content, plus product improvements and new features. We're committed to creating a community of support around local government website transparency. Our growing community of local government agencies both large and small have come to rely on Streamline to communicate important information to their constituents and stay compliant with new regulations. Sites with an asterisk (*) have used Streamline to achieve the Special District Leadership Foundation's Transparency Certificate of Excellence. Rainbow MWD is committed to transparency for our ratepayers and the traditional method of website development was not meeting our needs. Working with Streamline has produced a website that is clean, clear and provides our ratepayers access to information without the barriers in our old website. The Streamline team has been very flexible and the growing community of users will be a great benefit to the development of even better tools and features. Try Streamline Web for Free! Let us build a demo site for you, with absolutely no obligation. Contact us for more information or a demo!